K6OQK CA Connie,all signals were pretty stable with the exception of 80-Meters. Spectrum Lab crashed on me just as Marv started his WC FMT so I had to fall back to the 3586B/3336B combination only. A good time was had by all on the WC. Again, thanks to Pam for loaning you to us. K6YAZ CA Good steady carrier; some difficulty at first because of QRM, but 20 Hz filter took care of that. Used marker provided by 3336 generator and measured delta. KC0VSJ MO Couldn't hear you at all on 30M, 40M was so strong I wasn't prepared to insert a hot enough pilot. 80M was very weak, I missed the call up but the 100hz two tone was found buried in the noise and was usable. Very fine signal from West Coast tonight. KM1P MA This will be my last Sudden FMT for a few weeks ... I have to make a sudden move" to a new QTH"
N5PWG TX This was my first attempt to measure the difference in frequency of the two-signal test using AM mode.I was surprised to see the lack of a sharp peak on the spectrum; previously, I measured the frequency of each signal (in CW mode) and subtracted to get the difference. N8OB OH 80 meters was weak and quite noisy this evening. VE3OAT ON Some weird Doppler on the 40 m K5CM signal. Still using the old Sulzer freq standard, manually adjusted with reference to WWVB. Thanks for the FMT. W0PHD MN did not read the FMT bulletin until 9:20PM CDT no warm up time again too late for some of the tests and my receiver was drifting on the two tone test. Suggestion - drop e-mail to regular participants to look at your web page especially when day change. It was just luck that I even looked at the web page...Thanks again. Wally"
W3JW VA Conditions were average to above average with QRN . Doppler effects were moderate but quite noticeable (both on the test signals and WWV). The the two frequency AM mode" waterfall display was nowhere near as clean and quiet as last week." W6OQI CA 40 meters provided the best signal tonight. 30 and 80 meters were good but not as good as 40 meters. Over all signals are better than in the past few weeks. The shorter days are helping. Also it was nice to have normal 120 VAC line voltage tonight. The old Viking 1 transmitter keying was OK tonight for the west coast FMT. WA1ABI RI Conditions were good tonight, but heavy SSB QRM on W6OQI's 40m West coast signal. Thanks Connie & Marvin. 73. WB0LXZ KS New timebase - bill. WB9FIP WI Very tough 30 meter run. 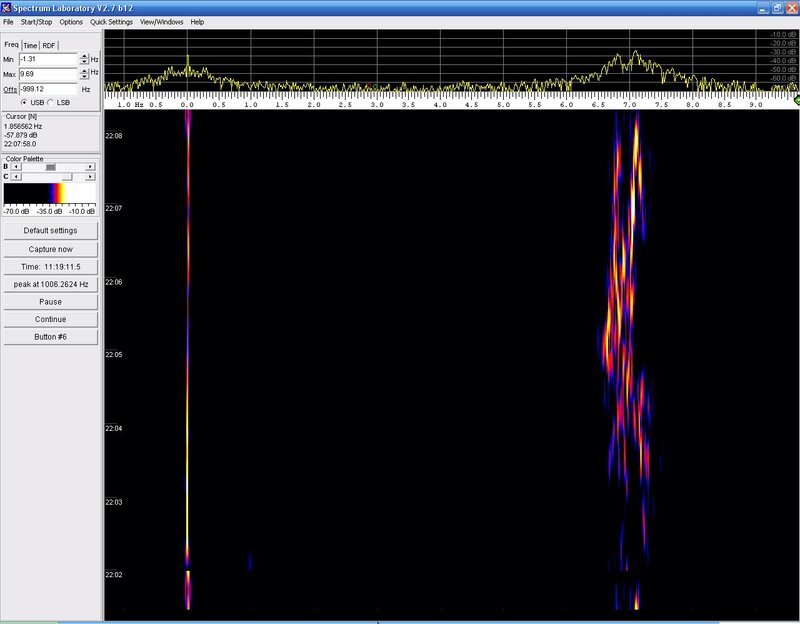 Lots of Doppler tonight: over -0.4 Hz 15 minutes prior to 30 meter run. Thanks again for the tests. Audio of K5CM recorded by VE2IQ with his TS-850 in AM mode. Screen capture of W6OQI by K5CM. My marker is at zero (7065539 Hz). Participants are refining their skill on the 80 meter difference measurement, with four stations hitting the "FMT nail" on the head, and more than half reading to better than .01Hz ....... Good going guys!!! Doppler on 40 meters seemed to be giving everyone problems. Only one station copied K5CM to better than .1Hz and evidently everyone had the same problem with W6OQI, with only Burt coping to better than .1Hz. Burt is only 8 miles from Marvin so we expect him to turn in a close reading with the ground wave signal. Stations copying K5CM 30 meter run to .1Hz or better.